he campaign took it’s name from another source, David Stewart of the Eurythmics had started working with Joe Strummer of the Clash and later Bono on a song in 2002. The song was titled “46664 (Long Walk to Freedom)”. Dave Stewart had approached Nelson Mandela in November 2002 about using the number for the basis for a song, and explained his desire to use the proceeds from the song for raising money for the Nelson Mandela Foundation. Stewart first approached Joe Strummer of The Clash to co-write the lyrics to the song, but after Strummer’s death Stewart finished the song with Bono. The two recorded the song with Youssou N’Dour and Abdel as the first in a series of songs for the campaign which would eventually be launched. The song “46664 (Long Walk to Freedom)” was available in two ways. One could call a special country specific number to donate to the 46664 campaign and then you could listen to the song as often as you would like through the phone for the remainder of the call. The phone number that one would dial was set up so that it incorporated the digits ‘46664’. The other way to listen to the song was through a digital download at the 46664 site. The download however featured a poor quality, and several audible ‘clicks’ are heard during the song. It was made available in Windows Media format (.wma) with digital rights management built into the track limiting the number of times that it could be copied or burned. Many users trying to download the track reported issues downloading the song and were unable to obtain a working copy of the song in this manner. The track was priced at 0.99 Euro, 1.19 USD, or 0.69 Pound Sterling. 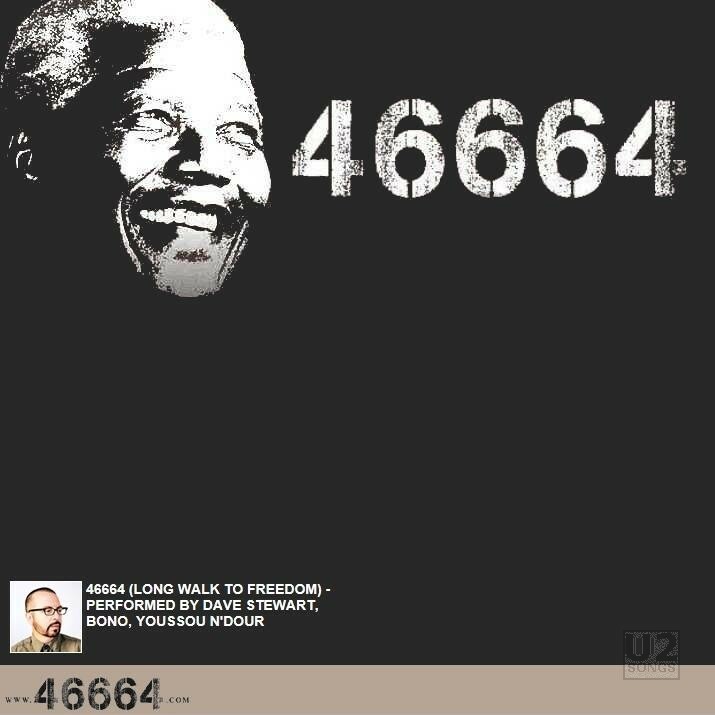 The song “46664 (Long Walk to Freedom)” was used as a centerpiece of a concert in South Africa on World AIDS Day in 2003. Bono and the Edge attended this concert performing several songs, and Bono participated in a performance of “46664 (Long Walk to Freedom)”. That concert was later released in DVD and as three separate CDs. The artwork included with this discography entry was taken from the 46664 website at the time of the download. The track itself did not come with an embedded cover image. No traditional liner notes in this digital release.